Written and directed by filmmaker Rian Johnson (of Brick, The Brothers Bloom, Looper), Star Wars: The Last Jedi is the second entry in the Star Wars sequel trilogy, following J.J. Abrams' Star Wars: The Force Awakens. Upon its release in late 2015, The Force Awakens received overwhelmingly positive reviews from critics and praise from fans worldwide for restoring the saga's former glory while injecting it with fresh blood. As beloved as Episode VII was, however, one criticism continued to appear: it was too safe; a rehash of George Lucas' 1977 film. If Abrams' movie was too safe, then Johnson's follow-up may prove too risky. Picking up moments after Episode VII's cliffhanger ending with Rey finally meeting Luke Skywalker, The Last Jedi begins with the evacuation of D'Qar, home to the Resistance's secret base. After the destruction of their superweapon, Starkiller Base, the First Order attacks the planet, with General Hux (Domhnall Gleeson) leading the charge with their massive battleship, the Dreadnaught. General Leia Organa (the late Carrie Fisher), Commander Poe Dameron (Oscar Isaac), and the Resistance fleet narrowly escape total annihilation by jumping to hyperspace, but, to paraphrase Han Solo, they're not out of this yet. Meanwhile, Finn (John Boyega) has recovered from the injuries he suffered in The Force Awakens and is eager to find his friend, Rey (Daisy Ridley). The Force-sensitive scavenger from Jakku has been sent to Ach-To, a planet of oceans and archipelagos, to find Skywalker (Mark Hamill), the last Jedi. 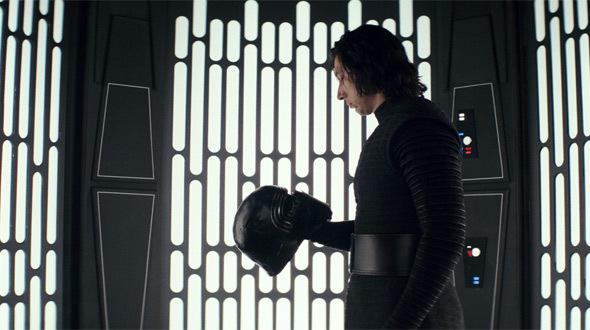 While Rey implores the broken, disgraced Jedi Master to train her in the ways of the Force, the evil Kylo Ren (Adam Driver) must suffer the consequences of failing his master, Supreme Leader Snoke (Andy Serkis). And that's just the first 15 minutes of Johnson's 152-minute movie, the longest Star Wars film yet. As is the case with every Star Wars episode, The Last Jedi's strength lies mostly in its characters and their relationships to one another. This time around, we're introduced to Resistance maintenance worker Rose Tico (Kelly Marie Tran) and her sister Paige (Veronica Ngo), an anonymous codebreaker (Benicio del Toro), and the Resistance's unwavering Vice Admiral Amilyn Holdo (Laura Dern). Johnson uses these new characters to further explore established ones, pairing Finn with Rose for a mission to the exotic and opulent city of Canto Bight, a Las Vegas-esque destination for the galaxy's wealthiest 1%, filled with casinos and racetracks. X-Wing ace Poe Dameron, meanwhile, has to learn the difference between being a hero and being a leader and finds himself at odds with the lavender-haired Holdo. 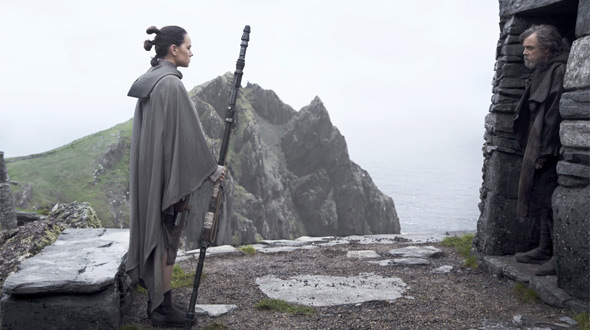 These side quests, while fun and inventive, distract from the centerpiece of the film, which is the mysterious connection between Kylo Ren and Rey, and their encounters with Luke Skywalker. After killing his father in The Force Awakens, the former Ben Solo is more conflicted now than ever. The Dark Side devotee struggles with his place in the universe, as does his Light Side equivalent, and both have complicated relationships with their would-be masters. There are so many layers to Driver's performance – wonderful, unpredictable flourishes of hate, compassion, humor, and incredible strength. His connection to Rey is propulsive, and his troubled past with Skywalker reshapes the character in exciting ways. Speaking of Rey, Ridley gives emotional depth to the character as we see her tested, not only by Luke, but by Kylo and Snoke as well. As great as Driver and Ridley are, though, The Last Jedi is all about the Skywalker twins. Anchored by some brilliant, emotionally rich performances from Hamill and Fisher, Johnson explores uncharted territory with these classic characters and challenges our decades-long relationship with them by giving them a new dimension. Fisher gives us a beautiful final turn as the Princess of Alderaan, while Hamill's fallen hero is a radical departure from the man we knew at the end of 1983's Return of the Jedi. It will be interesting to see how the fandom reacts to this film and the choices Johnson has made with not only the characters but the mythology as a whole. Being this bold, and straying this far from the safety of what's come before, provides some jaw-dropping moments of awe, but leaves too much room for disappointment. Like Kylo Ren, I find myself conflicted on The Last Jedi. There are things I absolutely love about it, then there are beats that don't sit right with me. If you're expecting a film that unlocks the mysteries of the Force or delivers shocking revelations, you may find yourself underwhelmed. The Last Jedi is not a film that provides answers, but possibilities. For all this talk of balancing the Force, we don't gain any real insight into what that means, or how the Jedi may have misinterpreted the Prophecy of the One. There are more mind-blowing revelations in a 22-minute episode of Star Wars Rebels than there are in this movie, and that's a bummer. We're told about all this cool stuff – the Knights of Ren, the Unknown Regions, ancient Jedi texts – but none of it matters. It's all just world-building for the sake of world-building, so Disney and Lucasfilm can push a series of novels, video games, or comic book mini-series to flesh out the details of the story that the film couldn't be bothered with. I loved The Force Awakens and left the theater on such an emotional high, excited for what was to come. This time around, I left the theater filled with doubt. Johnson shows us things we've never seen before in a Star Wars film – some work, and some don't. I appreciate his ambition in wanting to do something different, and I admire his confidence in playing fast and loose with something so beloved – Abrams was respectful to a fault, content to stay inside the lines Lucas had drawn so many years ago – but The Last Jedi takes too many risks and provides too few rewards. The movie seems only to be interested in subverting expectations, even if it's at the cost of investment in the story. There are several character beats and action sequences that exist only as misdirection. It's the cinematic equivalent of The Boy Who Cried Wolf – you can only fake-out the audience so many times before you lose their trust, and when you go for another big, powerful moment, it isn't as effective because you've conditioned the audience not to believe it. Even as I write this, I'm still trying to make sense of my feelings about this film. I need to see it a few more times to fully process everything. Maybe the past two years spent theorizing about where this new trilogy would go created impossible expectations that could never be fulfilled. I fully admit that I may be unfairly judging this movie by what it isn't – what I wanted it to be – than what it really is. Despite the issues I have with certain elements of the story, there's still a lot to love here. The cinematography by Steve Yedlin is stunning, the creatures and locales are inspired, and John Williams' score is thrilling and moving in all the right ways. The film's humor works, for the most part, and the action set pieces are exhilarating. One particular sequence involving Snoke's Praetorian Guard is an absolute all-timer that I can't wait to revisit. Overall, I really liked this entry in the ongoing Skywalker saga, and I'm excited to see where these characters go in J.J. Abrams' sequel Episode IX and beyond. I only hope that we get a conclusion to the saga that – like the Force – can achieve balance, by staying true to the characters we know and love while expanding the universe in ways that feel organic and earned.